Why should the wool people have all the dyeing fun? Fiber reactive dyes are specifically designed for dyeing plant fibers: cotton, linen, rayon, hemp, ramie, bamboo - even rattan and nettle. The dyes are safe, light and color-fast, come in a huge rainbow of colors, and can dye anything that originally came from a plant. Fiber reactive dyes are also referred to as cold-water dyes, because they do not require high temperatures to make the dyes permanent: no microwaves or boiling water required. Unlike acid dyes, these dyes react in an alkaline environment, and so require the addition of a base instead of an acid to activate the dyes. My base-of-choice is soda ash (sodium carbonate). It's best to buy soda ash in its pure form from a dye supplier. However you find it, make sure it is pure and has no additives or anti-caking agents. 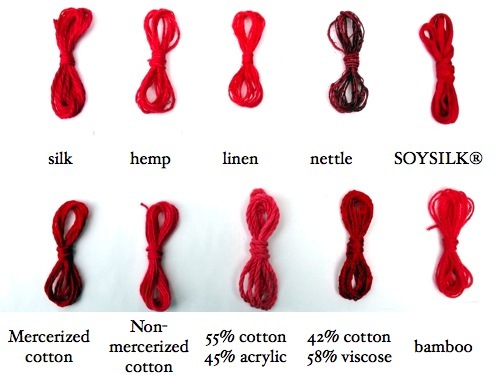 Different fibers take dyes in differing amounts. 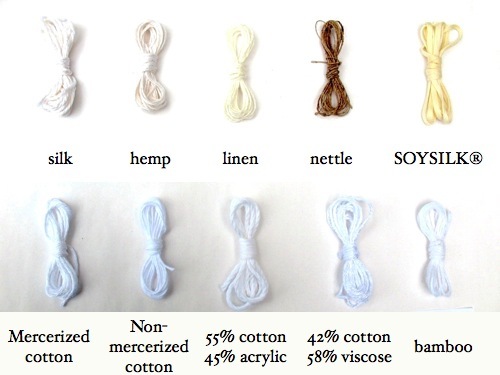 Linen will dye a slightly different color than cotton, even if they are originally the same color. Rayon takes dye vigorously and will dye up in saturated colors. If you're trying to dye a fiber a particular color, experiment first. The final color also depends on the original color of the yarn. Remember yellow plus blue makes green? 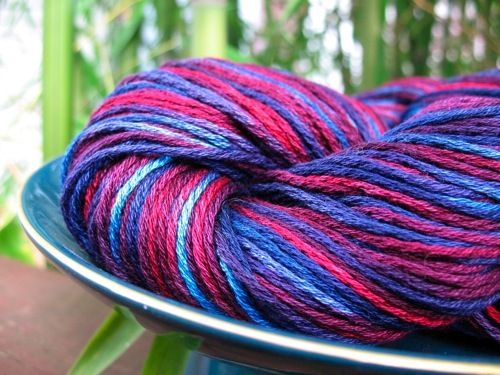 If your original yarn is red and you dye it with blue, the yarn will become purple. Cream-colored yarn will always dye a little duller than white yarn. If you are looking for very bright colors, start with a bleached white yarn. Orange yarn over-dyed with Fire Red, Peacock Blue, and Plum. You can also dye blends of fibers, including acrylic, polyester, or protein fiber blends. Fiber reactive dyes will NOT dye synthetic fibers or most protein fibers. The exception is silk, although I prefer not to dye silk this way -- soda ash is harsh on silk fibers and silk tends to lose its soft hand when dyed this way. Silk shouldn't be exposed to a soda ash solution more than 12 hours or it will begin to destroy the fiber, so you must rinse no later than 12 hours after dyeing. Also, fiber reactive dyes do not produce quite the same colors on silk as they do on cotton -- especially black, which produces a purple, deep blue, or dark green instead. Dye results depend on the yarn construction and content, but as a rule most man-made/plant fiber blends will look heathered after dyeing and appear much more pale than 100% plant fiber. One special note about cotton: cotton is sometimes treated in a process called mercerization, which makes the fibers sleeker, shinier, and more receptive to dye. 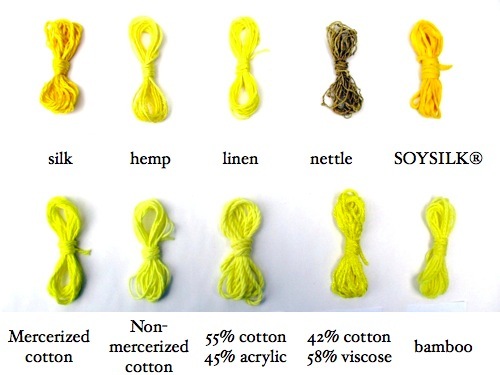 A mercerized cotton will dye into more brilliant colors than non-mercerized cotton. Mercerization is not always marked on the yarn label, but it's usually easy to tell: mercerized cotton will have a sheen, somewhat like silk. Non-mercerized cotton's surface looks and feels more matte. Fiber reactive dyes are considered fairly safe to use when they are liquid form. They are more dangerous as powder, and you should use caution and the appropriate tools when handling them. The dye particles are very fine to enable them to dissolve more easily in water, but that same property makes them unsafe to breathe and prone to floating in the air even with a small disturbance. Use a dust mask when handling the dye powder and powdered soda ash, one certified by a government agency as safe for small particulates (for example, in the U.S., use a dust mask approved by NIOSH). I also recommend that when working with the powders, you do it out of doors: breezes can blow away fine particles so that you do not breathe them. Because soda ash is caustic and dyes will dye ANY plant fiber and temporarily stain most protein fibers, including your skin, wear goggles and gloves while working. Lightweight disposable latex or vinyl gloves are fine, although I prefer heavier latex gloves because they can be used again and again. Yes, goggles are annoying, but spending 30 minutes rinsing your eyes out because you splashed dye or soda ash in them is not fun. Wear goggles. A couple more safety things: don't use any of your dye tools for eating or cooking, and keep dyes away from small children and animals - you don't know what they might do. water softener, if you have hard water. Minerals in water can disrupt the dye process. Dye suppliers often carry this. plastic bags for finished yarn. These should be large enough to accommodate a skein of yarn without the yarn edges touching. yarn for tying the dye skeins. I keep a rinse basin and a jug of water on my work surface, and any item I dirty (measuring cups, spoons, stirrers, funnels, etc) I throw into the rinse basin with some water. It simplifies cleanup and reduces the amount of dye powder that might be floating around in the air. 1. Prepare your yarn. Make the ball into a hank, and then tie LOOSELY in at least 4 places around the hank. When tying, make a figure-8 tie by bringing the tying yarn from the bottom through the skein, over the top, through the skein going the other directions, and tied at the bottom. 3. Mix soda ash fixer solution. I use the ratio suggested by Dharma Trading Company: 1 cup soda ash in 1 gallon hot water. Soda ash dissolves better in hot water, and it will have cooled to warm by the time you're ready to dye. I use a funnel to measure the soda ash directly into a gallon jug, fill with hot water, cap the jug, then shake shake shake. Add water softener if needed. 4. Once the soda ash is completely dissolved, pour some of it into a plastic basin. Put your prepared yarn into the basin, completely submerging it. Let it soak for 20 minutes or more. You can reuse this fixer solution until it runs out. 5. Meanwhile, mix the dye solutions. Measure out dye into a jar or cup that can accommodate at least a cup of liquid. For medium colors, measure 2 teaspoons of dye powder. Some dyes need a higher concentration - read the manufacturer's suggestions. For lighter colors, use less dye. For dark colors, use more dye. For safety, I immediately close the powder containers as soon as I'm finished measuring the powder. I then wipe off the outside of the powder container and dye cup with a wet rag, to catch any powder that might be clinging to the sides. After measuring out the powder, add a very small amount of warm water (1/2 teaspoon or so). Use a stirrer to mix the powder and water until it makes a paste. Add a little more water and thin out the paste. Finally, add a cup of warm water, in stages, stirring to dissolve the powder. If you're using sealable jars, you can put the lid on and shake it to mix the solution. 6. Transfer dyes to applicator bottles, if you choose. Bottles allow finer control over dye placement, but you can also just pour directly from the dye jars. 7. Remove yarn from the fixer solution and squeeze out the extra liquid. Lay out the yarn on your workspace. 8. Pour, spray, or squeeze dye onto the yarn. Remember the color wheel! If you place 2 colors next to each other which are complimentary (opposites side of the color wheel: e.g. red & green, purple & yellow, blue & orange) they will make BROWN. In general, unless you're dyeing a rainbow, it's easiest to stick to only 2 or 3 colors. A note here: plant fibers require MUCH more dye than protein fibers. With acid dyeing, most of the dye reacts and you're left with a clear or slightly colored solution. 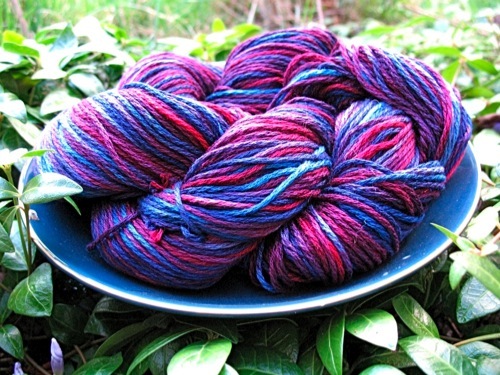 Not so with fiber reactive dyes - a lot of dye will be left over even when the yarn is finished. You need to apply more dye than you expect, or you will get spots of undyed or under-dyed yarn. Once you've finished applying a dye, squeeze the dyed yarn a bit so that the dye is transferred through the entire cross section of the skein. Otherwise, the yarn in the middle will be lighter in color than the outer yarn. Less squeezing = more color variegation. 9. 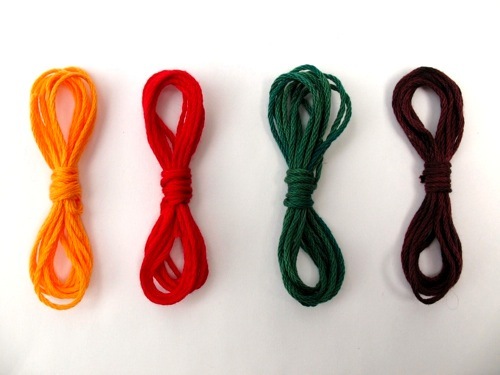 Transfer the skein to a plastic bag, arranging the skein so that differently-colored parts of the yarn do not touch each other. Tie the bag closed and leave in a warm place (at least 65 F/18 C). You need the yarn to stay wet and warm for at least 12 hours, and preferably 24. 10. After 12-24 hours (12 hours for pastels and silk, 24 for deeper colors), open the bag and rinse out the yarn with COLD WATER. Cold water removes extra dye without causing it to react. You must wash out all of the soda ash and most of the extra dye. This part can be tedious, there will be a lot of extra dye to rinse out. 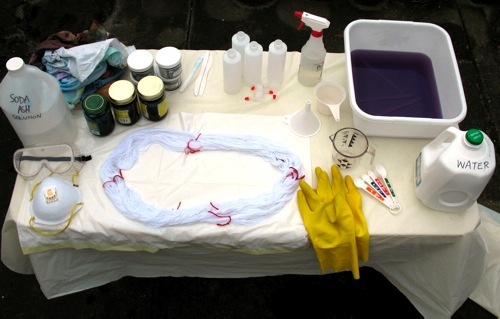 Dye can be rinsed out into a sewer system without worry - it's not toxic. The soda ash solution is weaker than most chemicals used to unblock drains. The dyes WILL stain the sink for a while, so use an outside hose or a utility sink if you can. 11. After rinsing until the water runs clear, I recommend you give the skeins a final wash in Synthrapol, a detergent and dye magnet. If there are any unreacted dye molecules still on your skein, it latches on to them, and keeps them from staining other things they will touch. Synthrapol requires hot water, and it will not work if there is soda ash still in the yarn (hence all the rinsing in the previous step). Follow the manufacturer's directions for the Synthrapol wash. After rinsing out the Synthapol, squeeze out any extra liquid and hang the skein to dry in a place away from the sun. The dye solutions can be used for the next couple weeks; they will gradually fade in intensity. After two weeks I dump dye solutions down the sink and mix up new ones. The soda ash fixer can be kept indefinitely. 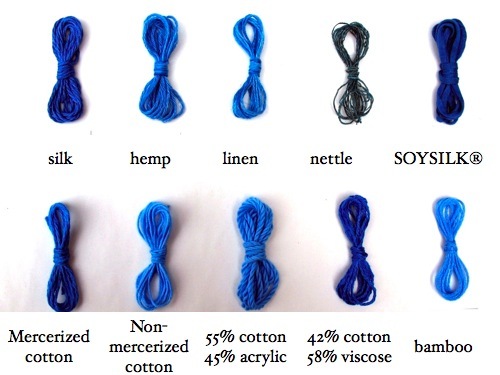 One more thing you should know about fiber reactive dyeing: soda ash is caustic and it will degrade fibers over time. You don't want to leave your yarn exposed to it for a long time. It's particularly hard on silk, which is why I prefer to use acid dyes on silk. Because of this, sometimes the dye process will change the hand of the fiber, so that it feels rougher after dyeing. If this bothers you, most dye suppliers sell commercial-strength fabric softeners which will re-soften the fibers. All dyes used in this article were Dharma's Procion MX Fiber Reactive dyes. Dye, supplies, and even un-dyed yarn. Their website contains many useful tutorials and suggestions. 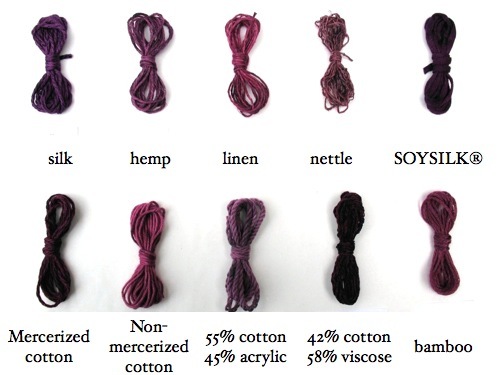 Paula has been dyeing fabric for many years and this site is full of great information. There is an emphasis on fabric, but most of this can also be applied to yarn. Carrie Griffin likes to dye and knit. When she's not doing either, she enjoys biking, hiking, reading, and tormenting small children with tie-dyed clothing.